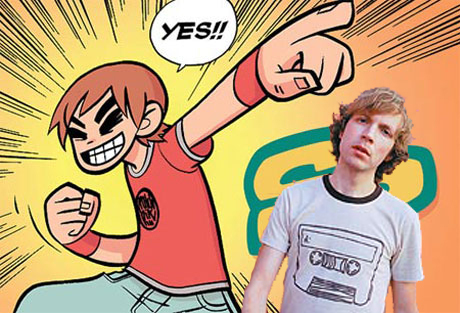 "Disgusting Rainbow" is the name of one of the unreleased outtakes Beck did for the Scott Pilgrim soundtrack. It is just a minute long, a punk rock song at its finest. We only know of it when Brian Lebarton played it and a couple other of the outtakes on his radio show. And while I'm sure the lyrics were adlibbed or written even quicker, I do feel like they are the essence of Beck, boiled down. I've noticed over the years certain songwriting tricks in Beck's words, and there are some popular, long-time tricks here in this song. Even though it's so short! Not to take the song over-seriously, but it is indicative. First, the idea of a "disgusting rainbow." Beck often times likes to take a beautiful image and distort it to something almost nasty. Take, for instance, "Sweet Sunshine" where the chorus takes the "sweet sunshine" and breaks it on your face. Sometimes Beck goes the opposite direction, like on "The New Pollution" where he takes an ugly word ("pollution") and turns into more of a positive. And while "Disgusting Rainbow" may not say a whole lot necessarily, this duality is present right from the title. The second trick Beck likes to do is to take common phrases and idioms and tweak them. He usually does it humorously. My favorite examples are on "Elevator Music": "the dishes wash good in the washing machine" or "tell me what's wrong with a little grind 'n' bump" or "drive your vehicle like you just don't care." These phrases build off normal, almost-cliched, lines like "bump & grind" or "throw your hands in the air like you just don't care" and slightly tweak them into something much more unique. That said, here, the last three lines "You can't teach a dog to fly / But you can give him some wings / And watch him try" seem to be tweaking all sorts of phrases and metaphors, from teaching an old dog new tricks, to giving someone wings to learn to fly. Finally, this song has a couple of words like "laminated" and "missiles" which show up occasionally in Beck's songs. Beck has his own lexicon sometimes that he taps into. I'm sure this all is due to Beck just writing the song so quickly, but still these are the 'tricks' that make Beck's writing standout and fun, and it's fun to see here.